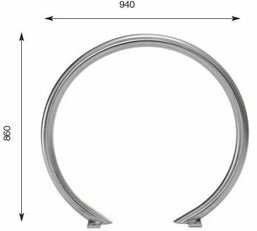 Our O Ring stand is a popular choice for town centres. The beautiful smooth lines give a clean uncluttered contemporary feel. Fixing dimensions: 940mm wide x 860mm tall (above ground). 50mm tube o/d diameter, 2.5mm wall thickness.